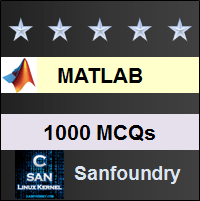 This set of MATLAB Multiple Choice Questions & Answers (MCQs) focuses on ” Convolution – 2″. 1. After what instant in time will the signal output become zero? Explanation: The graphical convolution gives an intuitive method to realize such cases. We observe that the second vector completely overlaps the first vector at an instant of 100 units in time. Now since we’ve flipped the second vector, we observe that the pulse of ones leaves the first vector at the instant of 149 units in time and we’re left with zeros. From here on, the output becomes 0 and hence, the correct option is 149. Explanation: Since the system is causal, the impulse response won’t exist for t<0. This is because the output of the system should not depend on future inputs. Thus only option t<0 is correct. Explanation: This is proved by the fact that since discrete signals can be thought of as a one variable polynomial with the coefficients, along with the order, representing the amplitude, at an instant equal to the order of the variable, of the signal- they are simply multiplied during convolution. Explanation: Circular and linear convolution produce the same equivalent results in MATLAB and hence the correct option is a=b. This can also be checked from the tabular method for linear and circular convolution. 6. A continuous signal can be represented as the product of an impulse function and the signal itself. Explanation: The continuous signal can be represented as an integral of impulses. This representation buries it down to the form of convolution of two signal where one signal is the impulse function while the other is the continuous signal. Hence, the above statement is true. Explanation: The signal is getting circularly convolved with a n impulse function which is delayed by 1 unit in time. Hence, the output of the above code will be the original function which gets delayed by 1 unit in time. 8. What is the Scope value if the signal generator has a frequency of 2 Hz only? Explanation: The above transfer function is that of a high pass filter. The cut-off frequency for allowing signals is 3Hz but the given signal frequency is that of 2Hz only. If the frequency of the signal generator was more than 2Hz- the output would’ve been entire signal at the same frequency but for >>3Hz. Now, the convolution in time domain is multiplication in frequency domain and the output of the transfer function block is the product of the transfer function and the laplace transform of the sinusoid. It can be checked in MATLAB that the poles of the resultant function will consist of one pole at s=-2+(-).707i which equivalently suggest that there is a 3 db decade if the input frequency becomes less than 2hz. Explanation: Z is the multiplication of laplace transform of two sets of two transfer functions. So if they get multiplied, the output can be the response of a system- provided one of the transfer function is the impulse response of a system while the other is just a representation of some signal. Now, this means that the poles of each function is provided in the second row vector of tf() command. This means the pole can possibly be at s=-4/3 since the elements indicate increasing power of s from left to right. 10. What is the inverse laplace transform of Z from the following? Explanation: Z is the convolution of P and Q in time domain which has been done in MATLAB by converting P and Q into the frequency domain and multiplying them. Observing that P and Q are the laplace transform of ramp and step functions respectively, Z is 1/s3. The inverse laplace transform of Z is simply option t2 then. Explanation: Z is in the tf domain. So, the ilaplace command wont be able to take such variables. We need to write the entire Z as an input to the ilpalace command and then it will give the inverse lapalce transform. Explanation: The first error MATLAB notices is that the input to the conv command is given within  but not () and this is the error it’ll return. The next error is the fact that there is no ‘ , ‘ between 1 and 2 so the conv command doesn’t understand the input.